1.What sizes of painting are you offer? Our general sizes are 8*10inch,16*20inch,'20*24inch,24*36inch,36*48inch,30*40inch,48*72inch. However, customers can require any other sizes. 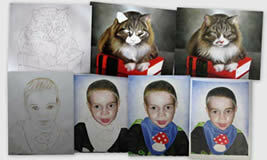 We can change the painting size, adjust the aspect ratio, or modify its color per your request. 2.How long does it take to get my purchase? Most orders can be delivered in about 2 weeks. For more complicated or oversized paintings, deliver time will be longer. During holiday season, deliver time may be affected too. 3.Can I order oil paintings which are not showed in your online catalogues? 4.How can I pay for my order? 6.What delivery methods do you use? 7.What if my purchase arrives in damaged state? 9.Why do you sell the paintings unframed? We let the customer choose the frame to match their decoration. Most of the time, the painting can be framed at local frame shop for a lower price than buying paintings that are framed. The flexibility is yours. 10.Can you create an artwork on commission portrait or painting? Of course, we can. Professional artists can create any portrait, copy or any other artwork, including sculptures at your request. 11.Can I get a discount, if I order several articles? In most cases, we offer a discount, provided that you are already our regular customer or purchase more than 3 articles. 12.Will their be any import duty or taxes on my painting? 13.I want to purchase a painting, but later. Can you reserve it for me? 14.How is a portrait packed for delivery? Every artwork is packed manually in ultra strong materials, applying special technologies, and then, rolled in special tube, carefully transported to its destination. If you have any questions, please contact us at (Email: portraitpaintingshop@gmail.com), and we will be happy to help you.